Grinder walked across my D.O.A. letters for the W2 Woodwards show of 13 Photographs of D.O.A. and spoke. Just do it, do. Or was he pointing to a Beatles song, or the Crystals 1963 hit Da Do Run Run. 9:40 am heading to W2 at 112 West Hastings, Grinder is watching birds, from the comfort of his, well my couch. 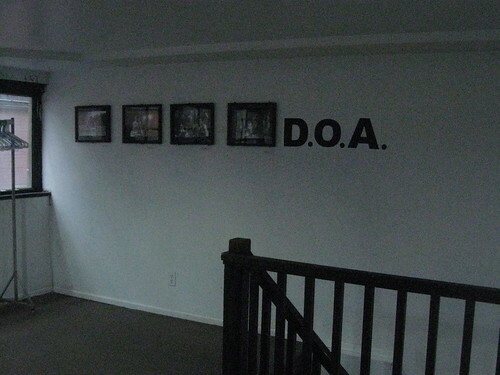 Letters moved to W2 Woodwards Community Media Arts at 112 West Hastings where there are my 13 Photographs of D.O.A. ya ya I know the O is a bit small. I hear that the Hotel Georgia wanted to be open for 2010 but fell so far behind in the construction and restoration that they wrapped their building in a flag, very nice, I think. The other flag, well maybe not. I quite like this outside art and I would not line for to get inside. Music everywhere on the street. Not over yet, Grinder and I are watching TV, hockey over, more coming on? Watched some of the 1st period on the outside of Ontario House. Thanks for the free no line up hockey viewing Ontario. The ads are misunderstanding my cat Grinder's name and there are adds for grinders on this blog, too funny.